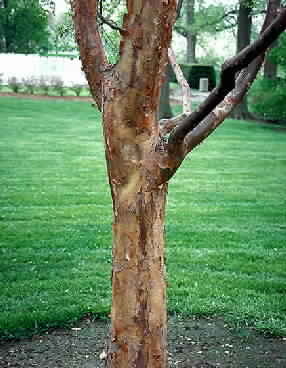 Paperbark Maple is a small tree with with cinnamon brown exfoliating bark that is beautiful year round. Leaves are small three lobed green in summer and brown to red in fall. Some years the fall leaf color can be quite spectacular. These can be grown as multiple trunk tree if preferred. A Paperbark Maple is a relatively small tree that will need some protection from the winter winds. These maples seem quite hardy for the north as they do well even in northern Michigan. These paperbark should do well as far south as northern Georgia through Kansas. The rate of growth appears to be about 6-12" per year. The paperbark prefers a wide range of soils and has a medium tolerance for salt and drought. The leaves can scorch in the hot summer sun without supplemental water. It prefers full sun to full shade ( in the south plant paperbark maple in the shade) and can handle moist soils. There are no serious pests that target paperbark maple. Paperbark maples make an excellent specimen tree. The paperbark maple is native to central China, arriving here in the early 1900's but only now becoming popular. It's slow growing but a must have tree for any house. To buy Paperbark Maple click the link below. 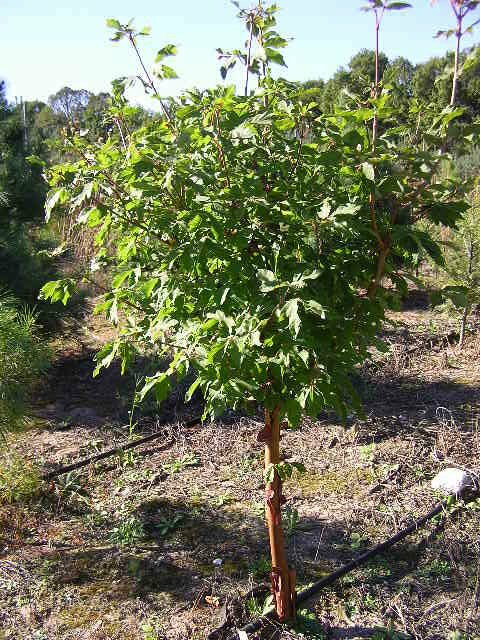 To order Paperbark Maple seedling by PHONE: We're glad to take your order by phone. For your convenience, we have a toll free number 800 568-9179. Phone orders can be charged to VISA, or MasterCard accounts.